Posted on Wednesday, July 29th, 2015 at 12:23 pm. My journey soon took me from Taipei in the north all the way down to Kenting in the south. After a one and half hour ride on the high speed rail into Zuoying, it was off to see the beauty of Kenting. One slightly bumpy two hour bus ride later, I found myself standing on the southern beaches of Taiwan, where the light ocean breeze carried the fresh scent of sea salt and sounds of crashing waves. I was stunned by how blue the ocean looked since I’ve grown up in California all my life and never seen such a deep blue color during my trips to the coast. Since I was already at the coast, I decided to check out the National Museum of Marine Biology (國 ⽴立海洋⽣生物博物館) near Kenting to take a look at how different sea life across the Paciﬁc is like. The last aquarium I went to was the California Academy of Sciences in San Francisco. And while there was a huge variety of marine life there (they had penguins! ), I don’t think anything could beat the series of underwater tunnels that the aquarium had. Once I got to the aquarium, I was greeted with a massive whale statue water fountain. And even though it was the middle of the winter, the temperatures were quite high and I may or may not have dipped my feet into water. Hey, everyone else was doing it too! After a few minutes of that fun, I headed into the aquarium and I found the tunnel, with the tealish blue hue of the ocean water above spilling across the ﬂoor. I was stunned: there were ﬁshes scurrying around, sea plants ﬂowing with the currents and rays soaring right above our heads. As I stood there taking all the sights in, I noticed another visitor who seemed to be in more awe than I was. Like everyone else, he began to snap a few photos with his camera when a ray suddenly swam right above him. He reached out to it, as if he had actually been transported straight into the ocean and was standing on the coral ﬂoor. I fumbled with my camera for a second and quickly kneeled down so I could frame the two. Unfortunately, the slight delay in getting my camera up combined with the ray’s speed were just enough to escape my attempts capture the moment. Regardless, this is definitely one of my most favorite shots from the trip. 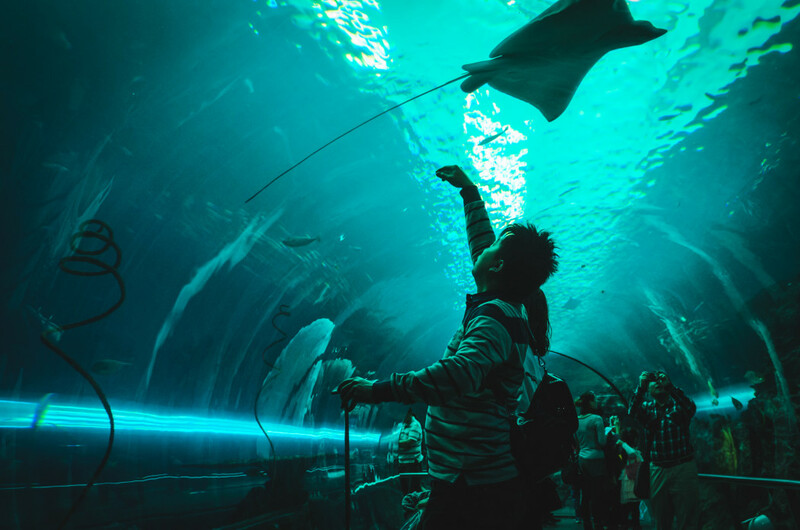 It just captures the visitor’s experience at the aquarium and how breathtaking it can be to seemingly immerse yourself in the variety of sea life there. The tunnels run for a couple hundred feet throughout the ocean ﬂoor and even through a sunken ship that now houses hundreds of ﬁsh and other life. They’re actually the biggest tunnels of their type in Asia. But the tunnels weren’t the only attraction there. Just across the lobby was another exhibit built into the tide pools where you could take a close look and pick up some starﬁsh while listening to the roar of the waves crashing through a blow hole in the rock walls. And even if you’re not into aquariums and such, Kenting is just a short drive away, full with local cuisines, endless beaches and a beautiful national park. Oh, there’s also a nice, vibrant night market there as well, if you’re not convinced yet.